"The hat would have to be lightweight, comfortable, attractive, protective and available in one size to cover the age group of approximately 7 months to 2+ years as parents would not value having to overspend on different sizes." One of the many reasons that Thudguard was granted its patent was because of the design eliminating the need for small, medium and large head sizing for a pre determined age group. 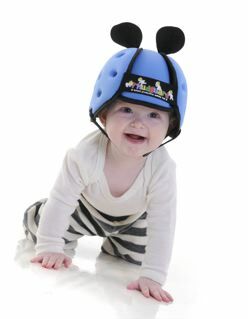 A child's head grows faster in the first few years than in any other time of life so Thudguard accommodates for this by stretching, or growing with the child a full 10 centimetres while still giving tested and certified impact protection. Thudguard is the only expandable head guard in the world that can claim this making this revolutionary new product truly unique. Thudguard complies with the Department of Trade & Industry's' Personal Protective Equipment Directive, Category II.